August had been sadly short on church visits, and I wanted a change of scene for my cello practice, so at the end of the month I headed for Great Bricett. 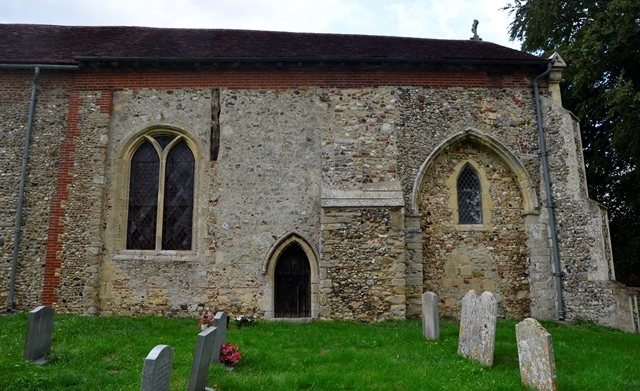 It was one of few churches remaining for me to visit fairly close to home, and I had been told it was open all the time. I wasn’t particularly excited at the prospect of my outing, but I did wonder what I would find. Would Great Bricett church surprise me as much as the likes of Ringshall, Battisford, Nedging and Naughton, to name just a few? They were all local villages that I rarely had reason to visit, and my acquaintance with them was barely more than driving through on my way elsewhere. I thought they possessed little beauty until I met their churches, and now I think of them quite differently. Great Bricett, however, I used to visit occasionally to enjoy its renowned vegetarian dining pub – though it could hardly be described as being ‘in’ the village, except by virtue of lying a few metres beyond the village sign on the main road. But since it moved to Thwaite last year that particular purpose has evaporated. I wondered whether its church would provide me with a new landmark. My journey took me past Wattisham Airfield along the main route from Bildeston to Needham Market, a charmless road I had driven countless times. No sooner did I leave the main road at the signpost, than the character of the place was transformed. It consisted of hardly more than a handful of houses – I’m not sure where the term ‘great’ comes in – but it had the undeniable feel of a rural village. 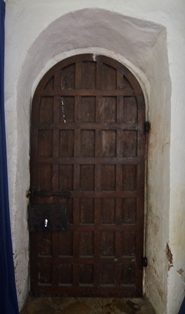 I was pleased by the discovery, and started to look forward to seeing the church. 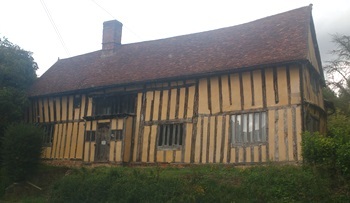 A little way up the lane, I came to a large and handsome farmhouse opposite the lane to the church. 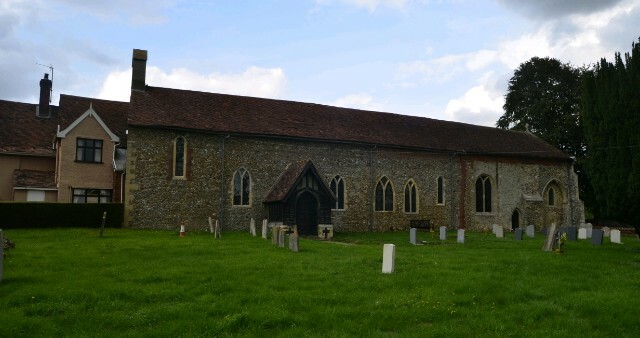 It was a short, dead-end lane, and the church was at the end of it, beside the village hall. I parked outside the churchyard, from where I had a good view of the long, thin, towerless church. What surprised me most was that there was a house built on to the west end of it. I couldn’t imagine how – or rather, why – this had come about. 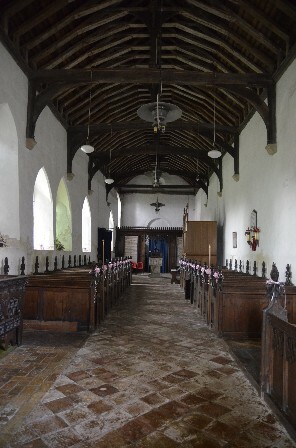 The interior did indeed surprise me as much as those other village churches. It was beautiful. 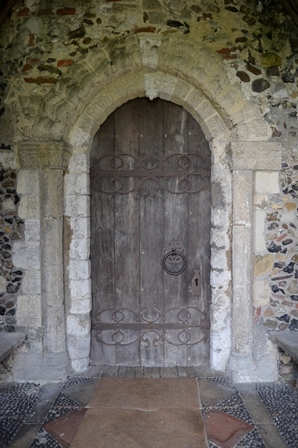 The doorway – slightly later than Norman, I would guess, by its faintly pointed arch – had engraved writing down the left side of it which I couldn’t decipher. 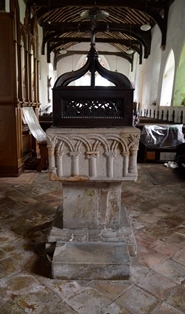 The church boasted no fewer than 8 crown posts supporting its long roof, a handsome font and floor and a stunning acoustic. It had no windows at all on the north side of the nave, which struck me as odd, but its south-facing ones provided sufficient light that this lack was barely noticeable. 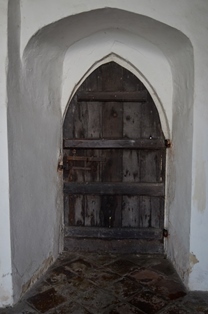 Various aspects of the church had aroused my curiosity: the house built on to the end of the church, the lack of windows in the north wall, and the inscription on the doorway. When I got home, I looked up the church. I had only got as far as reading two accounts of it – the entries on the Angels and Pinnacles website1 and the Corpus of Romanesque Sculpture in Britain and Ireland (CRSBI)2 – and already I had come across at least one contradiction. This only piqued my curiosity further, and I ended up spending a good hour searching for further information, in the hope that I would eventually be able to draw my own conclusions about which accounts were the more accurate. My afternoon and my cello practice were both lifted out of the mundane by this fascinating church. 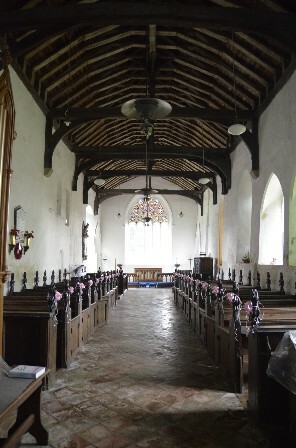 I was glad, yet again, to be proved wrong about the attraction of these humble mid-Suffolk villages, and I look forward to visiting Great Bricett church again.